Because the needs of industry, tertiary businesses, public administrations and shops differ, we offer a case-by-case approach starting with a personalised diagnosis and ending with turnkey solutions specific to each customer. A leading partner for waste management for businesses, the Schroll Group mobilises its people and resources to reconcile the different technical, economic and environmental demands. Our mission: to provide you with long-term, innovative solutions, whilst guaranteeing traceability and compliance with regulations, thanks to the customised management of your paper, cardboard, plastic, wood waste, non-hazardous waste, batteries, light bulbs, waste electrical and electronic equipment, biowaste, etc. There is no minimum to the quantity of waste we can treat. To guarantee maximum responsiveness and professionalism, you will have your own dedicated, autonomous eco-sales advisor: with the power to take decisions, he has the knowledge and skills to propose the best technical solution, tailored to your situation. Whether providing equipment on a permanent or occasional basis for one or more types of waste or a complete waste management service, the Schroll Group offers you the level of service best suited to your organisation and your objectives. to ensure you comply with regulations and guarantee the safety of your workforce. Depending on the quantity and nature of the waste to handled, but also the space available, our eco-sales advisors will guide in the choice of the most suitable equipment for your needs. To organise the selective collection of office paper and cardboard, but also plastic bottles, the Schroll Group proposes the eco-carton: a selective sorting box made entirely of recycled cardboard. The Schroll group company Sirmat provides equipment maintenance and cleaning services. With a shotblasting booth and automatic tunnel, 2 paint booths and a sheet metal workshop, Sirmat has the means to maintain the company's stock of skips and compactors in the best possible technical and economic conditions. Specially trained and accredited staff carry out inspections on compression equipment. Our sites also have several washing stations. With a fleet of 70 dump trucks, container carriers, tailgate trucks, refuse collection vehicles and boom trucks, as well as 6 of our own vans and a team of experienced drivers, our collection service has the capacity to adapt to your pace of waste production. Depending on your exact requirements, collection can be on request or in the form of a subscription with a pre-established schedule. Whatever the option chosen, a fast response is guaranteed! For the destruction of your confidential documents (archives, papers, cardboard items, counterfeit goods...), trust the know-how of Neutralis. 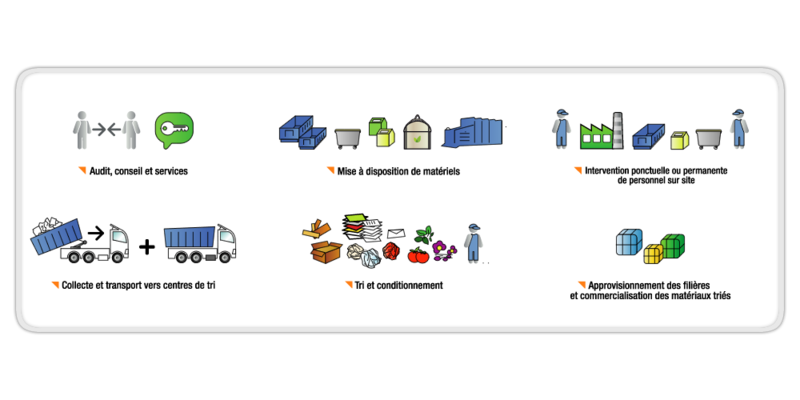 Recyparc, c'est un service 100% dédié aux artisans et aux commerçants. Un accès facile, un déchargement facilité et sous abri, des tarifs compétitifs, un recyclage optimisé…Simple et vraiment efficace. Recyparc is a service dedicated 100% to craftsmen and shopkeepers. Easy access, simplified unloading under cover, competitive rates, optimised recycling…Simple and genuinely efficient. We can send you, as often as you wish, the information you need to manage your waste correctly: collection dates, qualities and quantities taken, performance ratios, financial balance sheet, etc.